An epic trip even by our standards, we took three days to visit three colleges in three different states! Our trip started out on Wednesday morning when we drove from home to New Haven, Connecticut. First up, the University of New Haven! As we would find on this trip, we had scheduled a wide array of schools in relation to size, with New Haven being in the middle - not a big school, but not as small as another we would see later in the week. Did the group meeting with an admissions counselor and then toured the campus. Very nice campus, good facilities (albeit overrun with seagulls! ), this stayed on 'the list' for Mike but wasn't towards the top for sure. After the tour, and before beginning another long portion of driving to our next destination, we went out in search of some linner. Luckily for us, being near the beach, there was a plethora of sea food places to grab a bit, and Jill found a great one! Stowe's Seafood, on Beach Street in West Haven didn't disappoint - a lobster roll for each of us as well as a bowl of Rhode Island Chowder and New England Chowder and we were good to go! (and found a whole in the wall we would return to if ever in these parts again too). 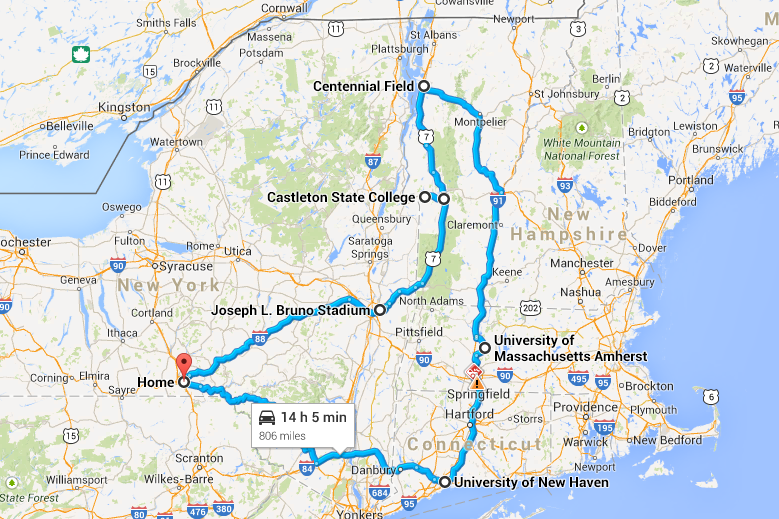 The road next took us to Amherst, Massachusetts, home of the University of Massachusetts. We stayed at the Holiday Inn Express there. In the evening, looking for some actual dinner, Jill once again found a great, no, EPIC place for us to go!! The Quarters in nearby Hadley is a kid stuck in the 80's but living in the 2010's dream! Tons of popular video games from back in the day (including my favorite Galaga!) plus BEER! Had a few bites to eat, drank some of the 'local' beer, and spent some quarters in the video games - a great night for sure! Thursday morning found a bit of a split in the traveling crew. Jill and Mike headed off to tour UMass-Amherst while I stayed back in the hotel room to take my advanced assessment final exam. After the tour (and exam) they swung back by and picked me up and we headed back over to UMass. Lunch in the food court, some money spent in the school bookstore, and we were off again. Just a short jaunt up the road (not really) we found ourselves in Burlington, Vermont for the first of two baseball games wedged into this trip. Centennial Field is reported to be the oldest active minor league baseball park in America, but it sure didn't have that feel to it! In the recent past improvements had been made and although aged, Centennial Field didn't feel 'old'. Great crowd for a Thursday night game, fans seemed into the game, and Mike even got to take part in a trivia question in the bottom of the seventh! (which earned him a NY-Penn League baseball!). Post game, we headed south to Rutland, Vermont where we would crash out for the night at the Comfort Inn Trolley Square. Reports had this hotel pegged as older and needing some work, and the reports were on the mark, but it was comfortable none the less. Friday morning arrived and we were off to college number three, Castleton State College. To set the scene on this one I asked Mike as we were driving there "what stood out about this school that you wanted to visit it? ", to which he replied "well, I met the admissions counselor at the college fair in Binghamton and he was the captain of the hockey team at one point and seemed cool...and, you said if we made it to Vermont we could go to a baseball game (which we had the night before)..." Ah, okay. On with the Castleton visit then! We first toured the campus and quickly realized that although this was the 'small' school of the trip it was also the nicest. Beautiful facilities, great setting, surpassed any expectation we had by a mile. At the end of the tour and meeting with the admissions counselor this school had gone from a side trip so we could see a baseball game to Mike's number 2 (Syracuse remaining his number one hope of course). With little (or, well, no) decent choices for lunch in Castleton we made our way back to Rutland. There we found Table 24 and had a good meal. Afterwards we wandered around downtown Rutland where a couple of streets were closed off for a street fair of sorts. After wandering around we hopped back into the truck again for the beginning of the final leg of our epic college trip, this time to see another baseball game. Troy, New York would be our next destination, with a return visit to the Tri-City Valley Cats. We had been here in 2005, but that was before I took pictures in ernest of ballparks so I wanted to get back again. Arriving a bit early in the Troy area, and with some time to kill, we stopped at Brown's Brewing Company which is along one of the main drags in Troy. We had eaten here a couple of times in the past, and of course sampled some of their beers as well. The positive impact that the local brew pubs at home has had on us was evident this trip though, as the Brown's brews no longer measured up. After a couple of bites to eat and beers we headed to Bruno Stadium for the game between the Valley Cats and Mahoning Valley Scrappers. Left in the seventh and made the final leg of our journey home. Our seats for the Lake Monsters game were Section B, Row K, Seats 25-26-27. Our seats for the ValleyCats game were Section 130, Row N, Seats 2.